This is the Swedish hardcover edition of Tony Hillerman's novel Sacred Clowns, translated into Swedish by Lena Schultz. It was published in 1995 in Stockholm by Legenda (Bokförlaget Natur och Kultur). 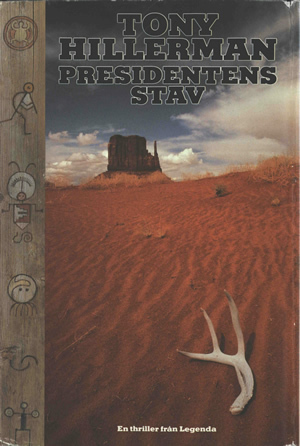 Cover is by Olle Frankzén and features a photograph of a desert landscape with red sand and a single antler lying on the ground in the foreground. In the background is a view of one of "The Mittens" of Monument Valley in Utah, beneath a blue sky with white clouds. Vertically along the spine are petroglyph-type drawings on a weathered woodgrain background. The woodgrain background carries over to the spine, with the author's name, title, and logo printed on the spine. The back cover has a white background with a two-paragraph synopsis, the publisher's imprint, and barcode. The inside front and back covers are blank. The inside front flap of the dust jacket displays author photo and biography. The inside rear flap of the dust jacket is blank. Binding: Dark blue cloth-covered boards with author name, title, and logo lettered in gold on the spine.